Aspex is delighted to welcome artist Stephen Turner to the Artist’s Studio. Contemporary Art in Northamptonshire. He has undertaken residencies for Stour Valley Arts at Kingswood in Kent and for Seafort, he occupied a derelict searchlight tower on the Shivering Sands in the Thames Estuary. The artist takes inspiration from scientific processes, from collecting red river water in order to observe sedimentation, presenting multiple series of glass jars filled with fauna and flora, to upcycling clothing by patterning the fabric with natural dyes. His observational drawings on discarded packaging use inks sourced from oak leaves; and small egg-shaped sculptures are made from dove feathers, mosses, shells, crab claws and other natural materials. Large and small video works reflect and comment as visual meditations on living and working in and around the Egg in different places. 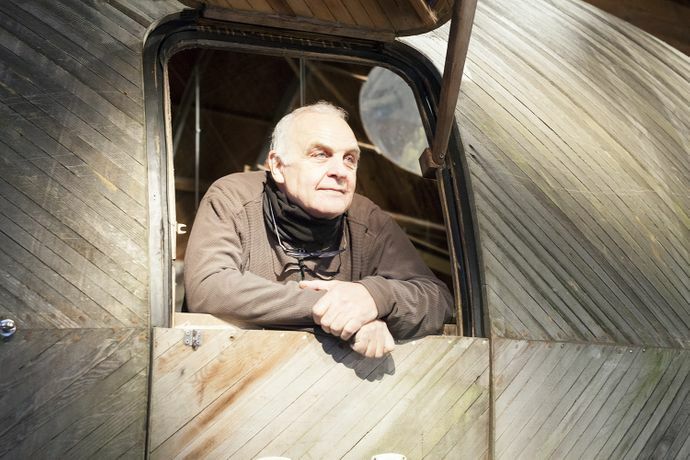 ‘Stephen Turner’s Exbury Egg’ is a wooden egg-shaped vessel in which the artist lived and worked for over a year. 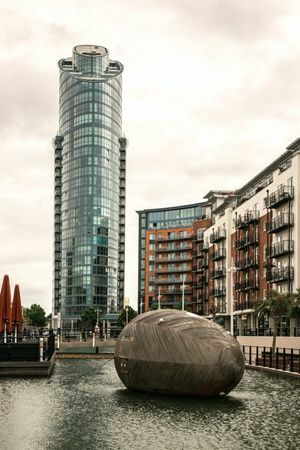 At Gunwharf Quays, ‘Stephen Turner’s Exbury Egg’ is located in the central pond of City Quay, as a monumental sculptural presence for over three months. This artist residency forms part of ‘Everything Comes from the Egg’ an exhibition comprising of drawings, prints, photographs, found objects, sculptures and video made by Turner over the last four years. ‘Everything Comes from the Egg’ offers visitors an opportunity to see the range of artworks, ephemera and documentation Stephen has made and collected over the course of the project. The artist has also completed residencies in the Egg on the River Beaulieu in Exbury, New Forest (2013 - 2014) and by the Leeds & Liverpool Canal for Super Slow Way in Burnley (2015). ‘Everything Comes from the Egg’ is financially supported by Trinity Buoy Wharf Trust, Gunwharf Quays, Canal & River Trust, SuperSlowWay, Jerwood Gallery, Milton Keynes and public funding by the National Lottery through Arts Council England.